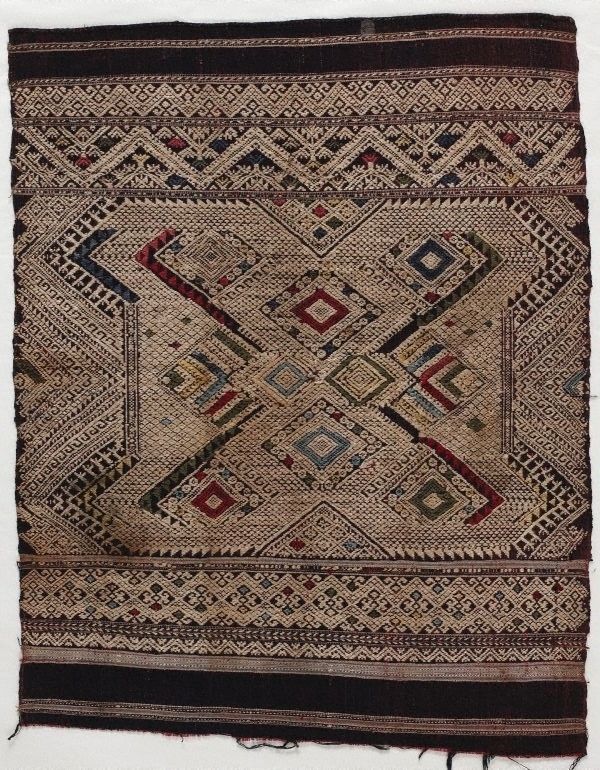 This piece comes from the end of a 'phaa biang', a textile type that is composed of several sections. As sections become worn, they are replaced, and this is probably one such replacement. Lao-Tai women wrap phaa biang cloths around one shoulder and the torso. These cloths are also used for healing practices ('phaa sabai'), as head wraps ('phaa khan soeng'), and as shoulder cloths ('phaa phai'). 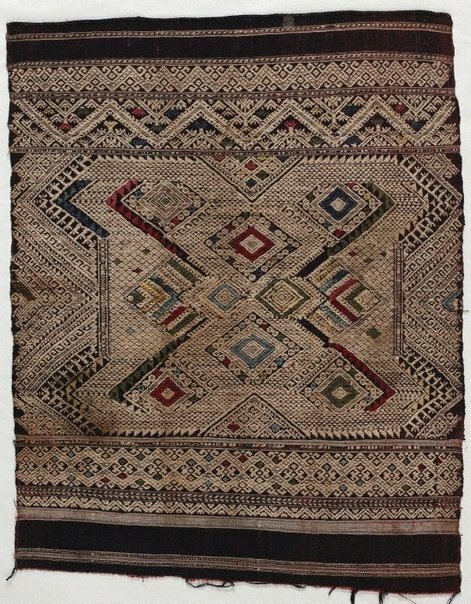 As a curative cloth, the textile was believed to be powerful enough to help the healing process through its combination of colours and motifs. This 'phaa biang' has red silk warp and indigo cotton weft yarns. The continuous supplementary weft threads are cream-coloured, and the discontinuous supplementary weft threads are multi-coloured. The decorative motifs include diamonds, eight-point stars or flowers, hook motifs ('dork khor'), and house gable motifs ('kaap'). The latter are represented as triangle imagery and patterning suggestive of the woven bamboo of which the houses are constructed. The scrolling triangles with curliques may represent a stylised ngueak or river dragon. The river dragons are associated with water; they protect people and ensure the arrival of the rain necessary for agriculture. 'Phaa biang' are not only used for ceremonial purposes, but also function as carrying cloths, bathing cloths, and decorative textiles. The quality of the cloth itself in part determines the use of the piece. Silk ones would be worn to ceremonies, whereas cotton ones are less significant.